A Scandinavian Christmas is wonderful for so many reasons. For us, the staff at 50 Degrees North, it represents fond memories from our childhood. Our Christmas tours are designed to share that joy and traditions with our international travellers. Our favourite memories of heading out into the forests and stealing our neighbour's Christmas trees translate into excursions into the forests on some of our Christmas tours to look for trees to decorate. Naturally, these days, we cannot actually chop random trees down but the excursion into the forest creates a simple bit of Nordic magic. Scandinavian Christmas food traditions are offered at the smaller boutique hotels with Christmas Smörgåsbord and traditional desserts. In Norway look for the traditional rice-porridge with blanched almonds added. The family-member or guest that gets the most almonds wins a large marzipan-pig. Some families have different rules: they only add 1 almond to the porridge, and the lucky "winner" gets the pig. Our hotels bring as many of these traditions into their Christmas offerings so that travellers can have an insight into Scandinavian food tradtions. Our specialty is Christmas experiences off the Nordic beaten path: we choose quiet, countryside locations, staying in boutique accommodation. But we never go past the Scandinavian capitals for a quick dose of pre-Christmas cheer: With short daylight hours and long evenings, the main streets are lit up by thousands of Christmas light decorations, decorated fir pines brighten up the city squares and you can go ice-skating with the locals on the city square rinks. 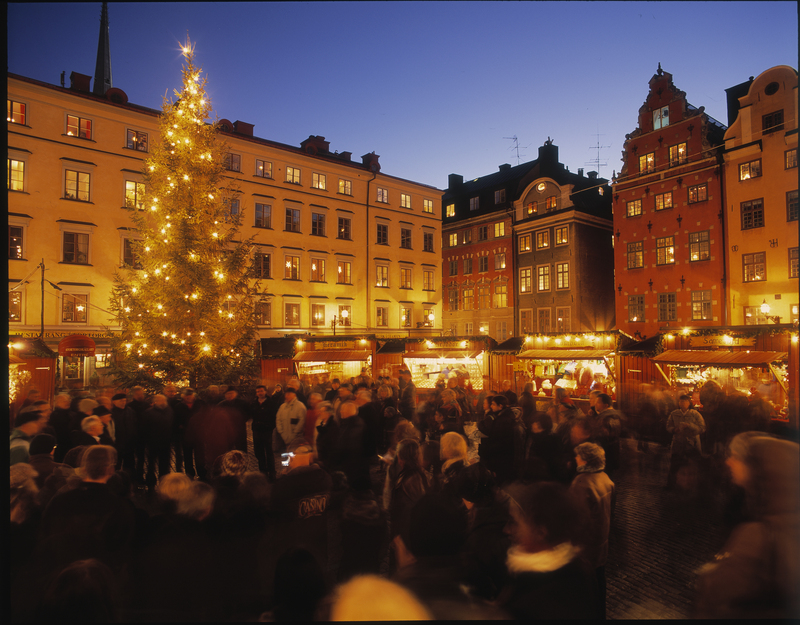 The Nordic Capitals of Helsinki, Stockholm, Oslo and Copenhagen also host a range of beautiful Christmas markets in December. We recommend combining our Christmas tours with a city-stay to soak up the seasonal excitement. It is a great way to recover from long-haul flights and the Nordic capitals are easily explored by foot or public transport. There’s no better way to get in the holiday spirit than visiting a local Christmas market. With their selection of traditional flavours from our region you can eat, drink, sample and shop for artisanal produce, handmade craft and beautiful keepsake decorations before heading north for your Christmas celebrations. Fingers crossed the weather gods will be kind before you arrive as part of the Christmas magic is the fresh powder-snow. The whole wide world seems extra quiet during and after fresh snowfall. The air is crisp and cool. We suggest you do like Scandinavian kids: go out to play! 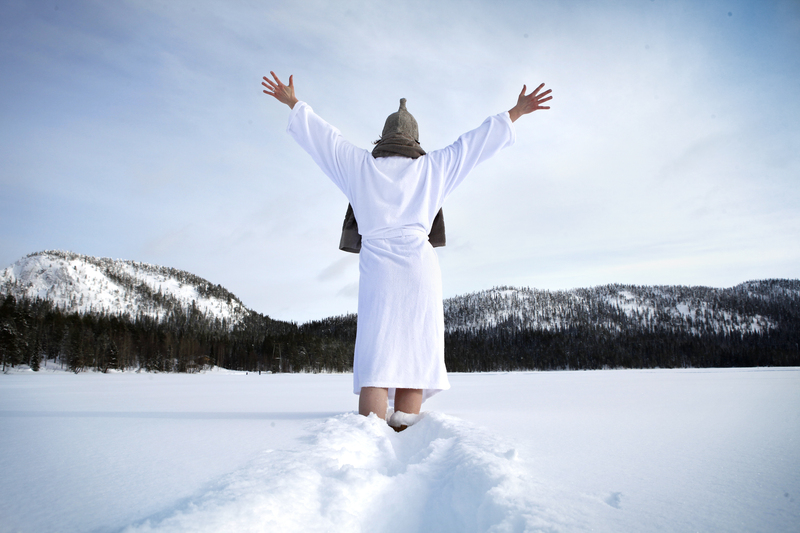 Create snowmen, snow angels, ski and walk the forest in snowshoes. Did you know Santa lives in Finland (and you can find him in Norway and Sweden too)? Your chances of meeting Santa and his elves are pretty good if you celebrate Christmas here. While this is the busiest time of year for Santa, he still takes time to meet with visitors, big and small. It’s an experience you and your kids will treasure. We can’t mention Santa’ without giving credit to his hardworking reindeers. 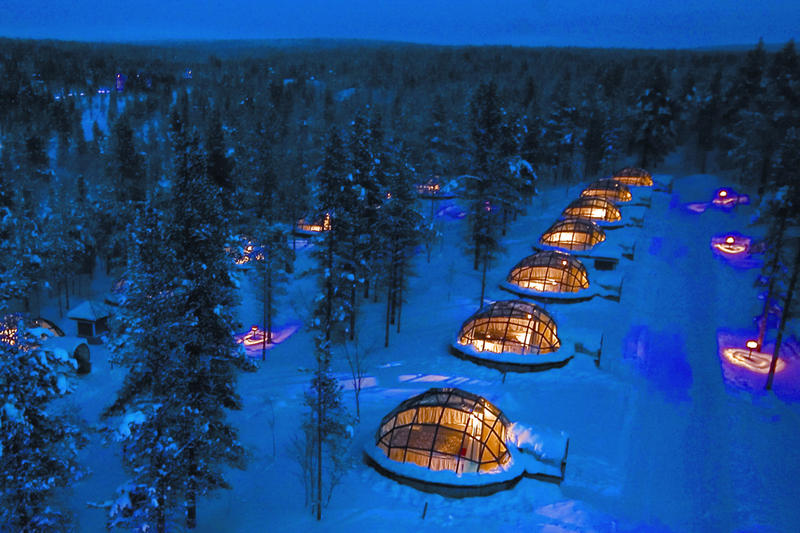 We’ll take you on a safari to local reindeer farms to meet these gentle animals of the North, or organise an evening sleigh-ride under the stars. If you are lucky you’ll see amazing Aurora Borealis dance across the horizon from the cosy comfort of your sleigh. Unlike Christmas in other regions, the days are short and the nights are long in December, but it’s part of the Nordic Christmas charm. The hour when the sun sets (around noon) is referred to as ‘the blue hour’ thanks to the stunning shade of blue on the snow-covered landscape as the brief daylight comes to an end. Our Christmas tours also include a range of exciting winter-activities. 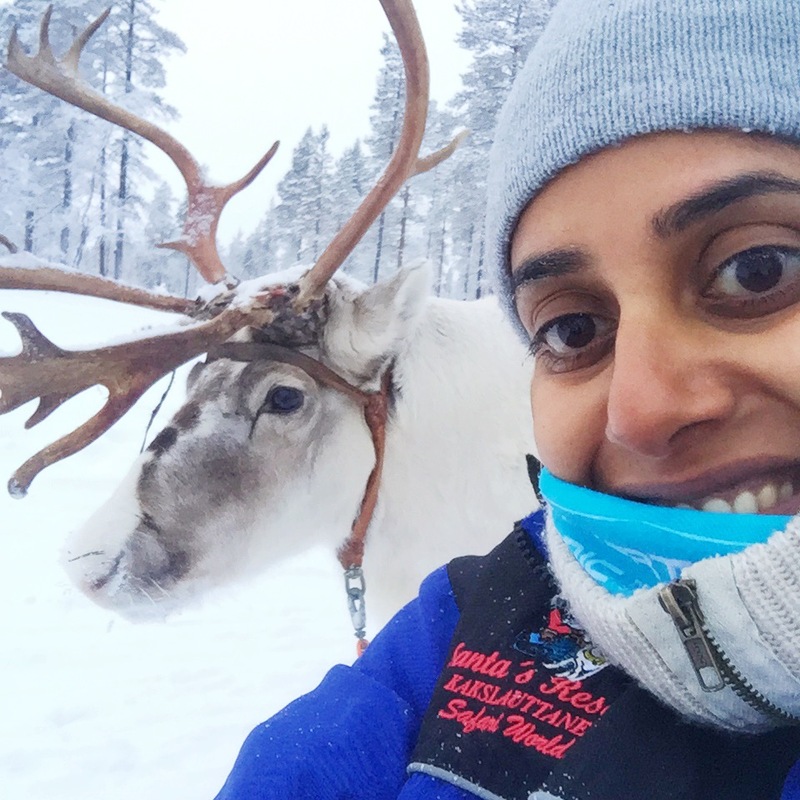 Husky-farms, reindeers, snowshoeing, guided Northern Lights tours, bonfires, snowmobile rides and private Santa visits are just some of the things you can experience during your Scandinavian Christmas holiday with 50 Degrees North. Many of our Christmas programs are escorted by our own Scandinavian staff and include private Santa visits. Our Norwegian office works over this period to ensure that your holiday is trouble free. Our Christmas holidays do book out early so please don't hesitate to contact us for a quote. Many of our Christmas tours are priced per group - i.e. triple or quad share for families reserving their own log cabin. Send us your details and we can work out the best price and configuration for your accommodation. All our tours, unless mentioned, are situated above or close to the Arctic Circle, allowing you the chance to see the Northern Lights. Several of our tours are close to ski fields such as Levi and Saariselkä. We can arrange for you to extend your stay to include some time down hill skiing or snowboarding. Nordic Capital cities are wonderful for New Year Celebrations with local and council fireworks celebrations. Our full range of Christmas tours can be found here. Image credits: Visit Finland, Visit Rovameimi, Visit Norway, Visit Sweden and Arctic Coast AS Foto Ørjan Bertelsen.